Mariners pitcher Aaron Harang is Tuesday's Player of the Day. Harang threw a two-hit shutout, striking out 10, in the 4-0 win over the Astros. Pedro Alvarez of the Pirates is National League Player of the Day. Alvarez homered and went 3-for-3 and drove in three runs in the 8-2 win over the Giants. Derek Norris of the Athletics is American League Batter of the Day. Norris homered, doubled and drove in four runs in the 6-4 win over the Yankees. Standings update: Tigers pitcher Max Scherzer rises to ninth place in Box-Toppers player rankings for the 2013 season (see the updated list of top 10 players on the home page). Scherzer (7IP 3H 6K) was Player of the Game in the 3-2 win over the Royals. Scherzer earns 1.0 Box-Toppers point for being Player of the Game, giving him 8.7 for the season. 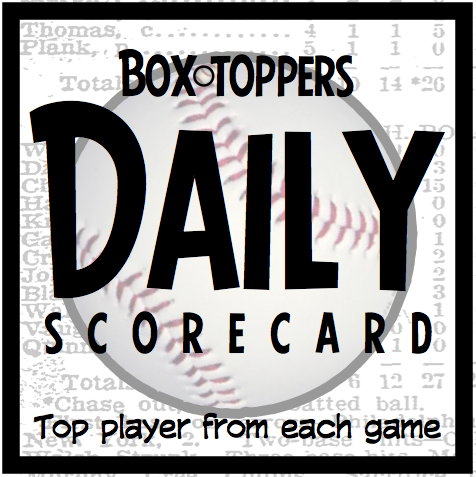 Harang receives 2.0 Box-Toppers points for being Player of the Day. Alvarez receives 1.7 for NL Player of the Day. Norris receives 1.5 for AL Batter of the Day.